Hi, trying to find the setting for the front wheel axle nyloc nut. I’m not sure what you mean by the “setting” for the front wheel. As for how tight the nyloc nut should be, well it should not be too tight, as the front wheel needs to spin freely, and you don’t want to have the ball bearings “crunch”. You’ll have to gauge the tightness of the nut by hand. I have a 2005 margay chassis that I raced with but eventually took it all apart and had some cracks rewelded.when I put the front axle on I set the spacers 3 top 3 bottom on the kingpins.When I put the stering wheel on my micron on steering wheel doesnt line up on top where the wheels are straight like it did before. You should be able to adjust the Track Rod ends ( http://kartbuilding.net/racingkart/Free_Racing_Kart_Plans_PDF/Main_Kart_Complete_11_Steering_Track_Rods.pdf ) so the steering wheel lines up. You’ll probably have to adjust both track rods to achieve this. we race dirt carts with no suspension on a small clay over. I keep having a problem with the car be twitchy in the front end the driver says is real jerky can this be the effect of to much caster? We have played with the toe out but it does not seem to help. Any advice would be greatly appreciated. Do you mean “jerky” as “over sensitive”? I.e. any movement of the steering wheel causes the kart to turn sharply? It could be a combination of both the castor and camber angles. It could also be the fact that your steering arm is too short. (It’s set at 135mm long on this DRG: http://kartbuilding.net/racingkart/Free_Racing_Kart_Plans_PDF/Main_Kart_Complete_04_Front_Stub_Axles_and_KingPins.pdf ) Increasing the length of the steering arm should give smoother control over the steering. It’s a case of testing and seeing. Let us know how you get on with it. Inclining the king pin is done to reduce king pin offset. Kingpin offset is the lateral distance from the centre of the contact patch to the point on the ground that the kingpin points to. The effect of too much kingpin offset is bump steer. The effect of insufficient kingpin offset is dead steering that lacks feel. Thanks for the information on Camber and King Pin Inclination (KPI). The steering setup on a kart is quite involved. There are many different angles involved. For the Camber Angle on my own kart, I went through many changes, and left it at 0 degrees for a while. On one of my karts I had rounded tyres (wheelbarrow wheels) and I found this did not work great with a large camber angle. This webpage -> http://www.bcot1.com/karting/ goes into detail with an interactive slider explaining all the Castor, Camber, King Pin Inclination, Spindle Angle and scrub radius. Its quite involved. If you have any examples, images etc. to compliment this, that would be a big help for people. Diagrams are one thing, but its better to see actual photos and images of the steering setup of built karts. hi, i’m building a go kart with the n shaped yoke attached to the chassis and the king pin bolted in the n shaped yoke and free to move about the bolt. 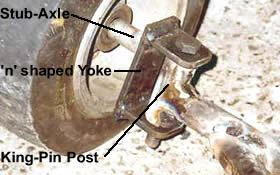 the stub axle and track rods are welded on the king pin with an angle of 104 degrees between the stub axle and track rod. their is no suspension to the kart. is it still important to consider the castor, camber and ackermann angle?